Last month PARCEO’s Institute for Community Leadership and Fieldwork had the honor of joining a collective of undergrad student researchers from Bryn Mawr, Swarthmore, and Haverford colleges in Philadelphia. Together we explored the principles of Participatory Action Research (PAR) as part of laying the ground work for ‪#‎barrioedphl‬–an ongoing partnership between the colleges and the community that “seeks to connect Latino core communities in Philadelphia and share information about education and other social issues”. 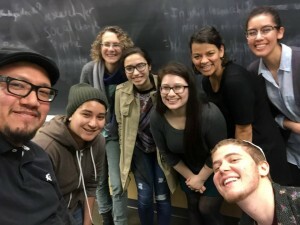 Students consider their own previous experiences of being “researched” and how PAR offers a different way of coming alongside a community to explore the issues together while centering the voices of the community. We look forward to continuing to work with this group as they develop research and relationships with the community!